It's been a few weeks since I have had a chance to write anything. Our hard drive went kaput for the 2nd time--- It seems that Dell either designed or Dell employees assembled the hard drive with the fan installed backwards... nice. Anyway- we are back up and running with minimal loss to data. Nothing new to report-- I've been working on a post for a while, but I can't seem to get it right... I just come off sounding like a conspiracy theory freak or a "we're all gonna die-- Game Over! " Aliens style nut case... so I'll keep playing with it until the time and words are right. 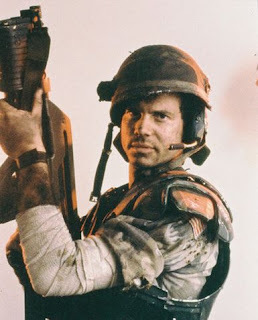 Oh and by the way... and to make it crystal clear--- There isn't a United States Marine that would ever behave like Bill Paxton's character did in Aliens.... ever. So, anyway, last Sunday Michael and I after a 3 year hiatus made it back to the Dayton Air Show--- specifically to see the F-22 Raptor. H*o*l*y C*r*a*p! This aircraft without a doubt should have our enemies shaking in their boots... For a fighter, this aircraft is huge--- 62 ft long with a wingspan of near 45 ft. Compare that to an F-16 (Viper or Fighting Falcon- you pick) which is not quite 48 ft. long with a wingspan of 31 ft... This girl, the F-22, although big and bulky looking is in fact very swift and manueverable.... she is stealthy, she can cruise at supersonic airspeeds with out using afterburners... She is one fierce bird and our enemies should be fearful... The best part and what is so reassuring about the F-22? It is a United States only asset. No sharing with NATO countries... all ours baby. Stick that. I'm including some really bad video I took-- no editing---keeping up with the F-22 was no small feet... the camera could not stay focused and that was on the slow pass. In part II, a separate post are a few of the photos I took. Enjoy. F-16 pilots watching Misty Blues--- "why would anyone jump out of a perfectly good plane?" An emergency landing by this 747 shut down the airport and the airshow--- were you on this flight? F-16 pilot signing autographs -- A hero kids SHOULD have! F-22 Raptor --- all I can say is incredible, wow, and OMG. How's that for a paint job? WW is back- Go say hi!